New customer - Register Now Forgot Password ? This Double Basket Fryer by R&V Works is the perfect fryer for your backyard fish fry or to serve french fries, onion rings, appetizers to go along with your BBQ. 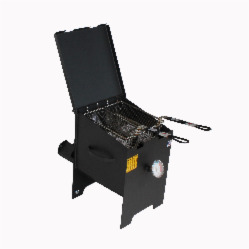 Combining approximately 4 Gallons of oil with 90,000 BTU of heat potential, this very portable deep fryer has the power to keep up with the demand of your patio cookouts, tailgating parties and small fish fries of 25 to 30 people per hour. Also being a multi Basket Fryer, you are able to fry different foods at the same time. All of R&V Works fryer works with the Burner Flue Hovering in the cooking vat, positioned so that the excess breading and/or batter will fall to the bottom of the fryer where the oil is cooler. This prevents the oil from being scorched by the sediments laying directly in the heating zone which will very quickly ruin the quality of your cooking oil. This results in a 70% reduction in oil usage when compared to other deep frying systems. The Fryer also features a built in 2 1/2″ thermometer making it easy to monitor the oils temperature. Made from solid carbon steel with a high temp charcoal gray finish, this fryer will withstand many years of use. This fryer is set up for liquid propane and is for outdoor use only! © Copyright 2018 Southern Pipe & Supply.